Tranche #3: March 2009 – watch the YouTube videocast here. Once again I’m working as consultant for the TNA’s UFO Project. I have prepared a detailed summary of the contents for the national and international media. This has been used to bookmark significant documents within the files, as navigating around the hefty pdfs can be a confusing experience. In addition, I have recorded a short podcast summarising the most important themes. All these features can be accessed via the TNA’s ‘UFO landing page’, along with archived files from the last two releases. There is also an updated version of my briefing document that provides historical context for all the UFO records held at TNA. This tranche consists of seven files containing more than 2,000 pages of material. Six of the files contain UFO reports copied to the MoD’s secretive Defence Intelligence branch DI55, between November 1987 and April 1993. During this period 1200 individual sightings were reported to the authorities. The release of these papers is in itself a victory for open government. For as recently as ten years ago the British Government refused even to acknowledge the existence of DI55, let alone comment upon their role in the investigation of UFO reports. The arrival of the Freedom of Information Act in 2005 brought this ludicrous situation to an end. But even then for at time it appeared unlikely we would discover anything further. It turned out that most of DI55’s historical UFO records had been destroyed long before FOIA could intervene. And, worse still, the two dozen files that had survived – dating from the late 1970s – were among a group of records stored in the Old War Office building that had been exposed to deadly asbestos dust. Initially, it appeared these files might also end up in the incinerator. But when news leaked out a campaign was launched to save the files, which eventually led to this release. The contents of this and the last tranche of files make intriguing reading. For me, working on this project has been like taking a trip down memory lane. In 1987 I was a 20-year-old undergraduate at Sheffield University with an interest in journalism. In-between lectures and propping up the bar I joined a UFO group based in northern England and managed to find time to investigate UFO reports that were flooding into newspapers in South Yorkshire and Derbyshire. Amazingly, one MoD file in this tranche contains a complete copy of a report that Gary Anthony and I produced covering our investigation of a “flap” of UFO sightings in the Midlands during August 1987. On 27 January 1988 I sent my 27-page dossier to Clive Neville, who was UFO desk officer at the MoD, asking if any of the reports could be explained. I also offered to send him further dossiers, enclosing with my letter another detailed report prepared by Philip Mantle. This contained a set of photographs which appeared to show a “flying saucer” skimming rooftops in Barnsley (later, using an American photo analyst, we proved these were fakes). In reply I received the standard “no defence significance” letter used by the MoD in response to all public UFO inquiries. But little did I know at the time, Neville had copied our reports to the Defence Intelligence Staff with a note that reads “they are quite detailed and of a better quality than I expected”. Praise indeed! During its travels along spooky corridors my “August report” was heavily annotated by someone with detailed knowledge of a subject that MoD publicly claimed to be of little or no interest to them. What’s more, it’s clear from the scribbles visible on these papers that details of the individual sightings they contained were entered into a computerised database which DI55 were secretly using to search for patterns in sighting data. (See DEFE 31/176/1, pages 337 onwards). I hope to post more on this topic later. One of the key themes to emerge from these papers is the curious Aurora spyplane saga. This is linked with a little-known set of colour photographs, apparently taken in the Scottish highlands, which appear to show a large diamond-shaped UFO shadowed by military jets. From the late 1980s the British press was buzzing with rumours about a stealthy, cutting-edge aircraft that some experts believed was an advanced US ‘black project’. Codenamed Aurora, the spy plane was said to be capable of hypersonic speed. Alleged sightings frequently made headlines in UFO magazines and in aviation weeklies such as Janes’ Defence. But the US Defence Department always denied such a project existed and two decades have passed without any real evidence that it ever did. And these DI55 papers show just how easily the intelligence services can accept such exciting speculation as fact. DI55’s main responsibility involves the collection and assessment of intelligence on ICBMs and cutting-edge aircraft. Judging by the contents of these and other files during the 90s some of its personnel clearly did think it was possible, indeed probable, that someone – possibly the US – was flying an advanced black project aircraft within the UK Air Defence Region. The most intriguing linked incident occurred at 9pm on 4 August 1990, at Calvine, a remote hamlet on the A9 near Pitlochry in Scotland. According to the scanty details released by the MoD, two men saw a large diamond-shaped UFO hovering for about ten minutes before it disappeared upwards at great speed. During the incident military aircraft were seen making a number of low-level passes. One of the men had a camera and obtained six colour photographs showing both the UFO and at least one of the jets. The negatives were sent to the RAF Pitreavie and the Scottish Daily Record who passed them to the MoD. The images were scrutinised by the MoD who identified the jet as a Harrier. They were also able to spot a second Harrier, but were unable to identify the large object clearly visible on the prints. Two poor quality photocopies can be seen in the file DEFE 31/180/1 on pages 37-38. This story was treated very seriously, as a defensive press line was prepared in anticipation of questions from the media, which strangely never materialised (this can be read in DEFE 31/179/1: pages 157-8). The briefings states that inquiries had failed to identify the Harriers shown on the photograph, as records suggested none were airborne at the time. In the event, it appears the Daily Record decided not to publish the story. As a result the true significance of the photographs has remained unclear until the opening of these DI55 files. Nick Pope was the civilian opposite number of the DI55 desk officer during this period (1991-94) and he was the first to publish a brief account of the incident in his book Open Skies Closed Minds(1996). Pope described the photographs as “one of the most intriguing [UFO] cases in the MoD’s files”. He also describes how he kept an enlargement of one of the Calvine pictures on his office wall until it was taken down by his head of department. In July 1996, prompted by Pope’s account, Don Valley MP Martin Redmond, tabled a parliamentary question on the Calvine photograph. In reply, MoD said: “A number of negatives associated with the sighting were examined by staff responsible for air defence matters. Since it was judged they contained nothing of defence significance the negatives were not retained and we have no record of any photographs having been taken from them.” (Hansard, written answers, 23 July 1996). Negatives may not have been retained, but it appears that further secret work was carried out on the prints that were retained by the MoD’s Defence Intelligence Staff. 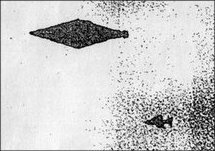 In January 1992 – long after the negatives had been returned to the photographer – they tasked intelligence staff at JARIC (the RAF’s photographic analysis unit based at RAF Brampton) to produce detailed line drawings of the unidentified object. The task sheet notes that “sensitivity of material suggests very special handling.” (see DEFE 31/180: pages 55-57). From that point the paper trail goes cold. Many questions remain. Who was the photographer and how can we be sure his story was genuine? Why did the Daily Record decide not to publish the photographs in 1990? If they really were taken on the date stated, then why were the MoD unable to trace the origin of the Harriers clearly shown in the print? And why, almost two years later, did someone decide to request, in secret, further investigations? All we have is the usual rather bland statement that MoD decided the incident was unexplained but of no defence significance: case closed. As a result, this report was added to a long list of others, including the notorious Cosford incident, that helped to convince some of the more imaginative MoD staff that someone was flying an unidentified stealthy craft over the UK. But this is faulty logic and puts the cart before the horse. Surely the first question any investigator should have asked was: does the story itself stand up to scrutiny? Sadly, there isn’t any evidence in these files to suggest the MoD ever spoke to the photographer, let alone asked any critical questions about his story. As the WMD farce proved the spooks can and are fooled by faulty intelligence – especially when they want to believe something is true. The files also contain some intriguing papers relating to the death of USAF pilot Captain William Schaffner during an exercise with the RAF in 1970. Some UFO conspiracy theorists, led by the retired police sergeant Tony Dodd in his book Alien Investigator, have tried to link this tragic incident with UFOs and Government cover-ups. The truth, as always, is much less sensational if depressingly familiar. The basic facts are these: In September 1970 Schaffner, then a 28-year-old USAF exchange pilot married with a young family, was stationed at RAF Binbrook in Lincolnshire, on England’s east coast. He died on the evening of 8 September when the RAF Lightning he was flying ditched in the North Sea during a low-level practice interception exercise. His body was never found. In 1992 the Grimsby Evening Telegraph resurrected the mystery, making sensational claims concerning UFOs, aliens and a cover-up by the Ministry of Defence. The paper published a serial investigation quoting an anonymous informant who claimed Schaffner’s plane was scrambled as part of an operation to intercept UFOs tracked on NATO radars. The paper’s main source provided what appeared to be a transcript of the pilot’s final exchange with his ground controller. This made dramatic reading. It purported to describe events as he approached the UFO, after which all contact was lost. Shortly afterwards RAF personnel involved in the event wrote to the paper pointing out discrepancies in the transcript. This eventually identified it as a clever fake. The person responsible has never been identified and his motive in constructing such a complex hoax remains unclear. Ever since the story reappeared in 1992 it has been recycled by UFO enthusiasts and inevitably ended up posted on the internet. Some of the more credulous used it as further evidence to support their conspiracy beliefs. Few have thought it necessary to check the facts. Inevitably, these stories were seen and read by Schaffner’s sons, now in their 30s and living in the Chicago area. As a result of the stifling culture of official secrecy that pervaded all military activities during the Cold War, Schaffner’s widow had never been given a full account of the events that led to her husband’s death. What was the pilot’s family to make of the bizarre and sensational claim that their father met his death as part of a secret war between aliens and earthlings, as alleged on the internet? Copies of the newspaper stories and correspondence from the public can be found in DEFE 31/181/1: 210-268, 181-197. The files also contain a summary of the original RAF Board of Inquiry report into the fatal crash completed in 1972. This report was classified as “restricted” and could not be released in 1992 when the UFO claims first emerged. But a full copy can be seen at DEFE 31/181/1:240-246 and, after the intervention of the BBC, the MoD finally provided Schaffner’s sons with a copy. The inquiry report contains no mention of UFOs. It concludes the pilot’s death was a tragic accident that occurred whilst the Lightning was shadowing a RAF Shackleton during a tactical exercise to test Britain’s air defences. The whole story was subject to a detailed re-investigation by the BBC North Inside Out programme in 2003 which conclusively debunked any UFO connection to the original incident. This can be followed on the Inside Out page here. Interested readers are also advised to read the detailed article I wrote for Fortean Times during 2005, which is available via my webpage here. There is a lesson here: conspiracy theories should have a public health warning attached to them. The truth isn’t always out there, folks. The origins of the Condign report? These files reveal how in 1988 DI55 were involved in a project to produce a computerised database of UFO reports, working with staff from a branch of the RAF scientific staff. They hoped to use this as the basis for a secret MoD study of UFO reports. A key document produced by DI55’s assistant director on 14 January 1988, reveals that a contractor had been inputting data into computers “as a part-time low priority activity”. He adds that “I personally doubt that the MoD would lose much if we filed UFO reports in the waste paper basket”. But because the subject “is given prominence by enthusiastic cranks” it was necessary to keep a record so that ministers could reply to Parliamentary questions. See DEFE 31/176:423. But the UFO project came to a dramatic halt later in 1988 when the head of MoD’s Secretariat (Air Staff) learned of a plan to task a work-experience student with the job of inputting a sample of 100 UFO reports into computers. Sensing a public relations disaster if news of the project’s existence were leaked, in March Sec(AS) demanded all work on the project should cease. In a memo dated 11 March 1988 a clearly exasperated Defence Intelligence officer wrote: “I understand that when Sec(AS)2 heard about the study, they decreed that all work should cease as it was in contravention of Ministerial statements to the effect that UFOs did not pose a threat to the UK, and that resources would not be diverted from more important work to investigate UFO incidents…[we understand] that there was some concern about public reaction if knowledge of the work being undertaken emerged in the media” (see DEFE 31/176:224). Nevertheless, DI55 continued to log UFO reports and would eventually obtain funding for a full study (Project Condign), completed in 2000. RAF fighter jets overtaken by UFO? This incident took place on 5 November 1990 over Germany: The crews of six RAF Tornado jets from 2 Squadron, Laarbruch, reported being over-taken by giant UFO whilst on an exercise controlled by Dutch radar. The pilots believed the UFO could have been a test flight of the then top-secret USAF F117 Stealth fighter. Their brief report and internal discussion can be found at DEFE 31/180:180-182. The MoD papers reveal that no investigation was carried out into the sighting because it “occurred outside UK airspace”. But intelligence officers appeared to believe the pilots may have seen a top secret American aircraft and UFOlogists who inquired about the incident were advised to contact the Dutch air force; see: DEFE 31/180:157. It later emerged that the RAF Tornado pilots had actually seen burning debris from a Soviet rocket body, used to launch a satellite into orbit, that fell back to earth, re-entering the atmosphere in a spectacular light show over central Europe. A re-investigation of the incident during 2005 by Dutch researchers – plus a recording of the discussion between the pilots and Dutch ground controllers – can be found here. “One of our more unusual UFO reports” notes a covering letter from RAF Wattisham copied to MoD and Norfolk police, dated 21 November 1989. The RAF base received a call from “a distressed female” who refused to divulge her name and address. After she was reassured she told the following story: “[at approx 10.30pm on the previous evening] she was walking her dog on a sports field not far from her home in Norwich. She was approached by a man who asked her if she would listen to what he had to say. She described the man as 5’5” fair hair with a Scandinavian type accent and dressed in a light brown garment similar to a flying suit. He asked her if she was aware of stories about large circular flattened areas appearing in fields of wheat, and then went on to explain that he was from another planet similar to earth and that the circles had been caused by others like him who had travelled to earth. He went on to explain that the purpose of their visits were friendly but that they were told not to have contact with the people of earth for fear that they might be treated as a potential threat. He had spoken to her because he felt it was important for contact between the two people to occur. The caller said that she was completely terrified while this was taking place and couldn’t remember much else about the conversation. After about ten minutes the man left her and she ran towards home until she heard a loud buzzing noise behind her and turned to see a large spherical object, glowing orange-white rising vertically from behind some trees which rose steadily until out of sight.” RAF Wattisham’s report says “[our] conversation with the lady lasted about one hour followed by another ten minutes when she rang again. I could not get her to divulge her name or address but I believe that this was a genuine call.” See DEFE 24/1938: 38-39. On the night of 21 February 1988 a helicopter crew reported a close encounter with a “very bright flashing red light” which first appeared stationary 10-20 miles away. Then it made directly towards them, approaching within half a mile at an altitude of between 3-4,000 feet. The UFO appeared to be 200-300 yards long with red and white lights and appeared “to swerve to miss the helicopter” as it descended. “Then [the UFO] appeared to stop, remained stationary for a while, then accelerated in reverse on a parallel course.” There is no evidence of any follow up by MoD. No location is apparent in the brief report at DEFE 31/176: 257. Two air traffic controllers at Heathrow filed a report with MoD describing a black inverted boomerang shaped UFO seen from the airport control tower early on the morning of 17 December 1992. The object was stationary, then moved steadily away. DEFE 31/ 181: 128. One week earlier, on 9 December, numerous witnesses in Louth, Lincolnshire, including the Commander of RAF Donna Nook bombing range, reported seeing three lights which appeared to be attached to a large, triangular shaped craft. This UFO hovered, turned on its axis and then shot off upwards at a speed estimated at 500 mph. DEFE 31/ 181: 281-2. DI55 and MoD Security were asked to look into “any security implications” following a report of a UFO near Belfast (Aldergrove) Airport, Northern Ireland, in December 1989. A man jogging at Glenavy reported seeing “a missile shaped object, approx 10-12 ft long” with a green neon-coloured flame emerging from the rear zoom silently overhead. It disappeared with a “muffled bang”. The Royal Ulster Constabulary were asked to investigate if the sighting was linked to IRA activity. Inquiries discovered two helicopters were airborne at the time but the pilots did not see anything unusual. Papers at DEFE 24/1938: 1-9; DEFE 31/179: 209-217. UFO implicated in power-cut? : Police received calls reporting mysterious lights in the sky; at the same time a power-cut left parts of Ipswich, Suffolk, in darkness on the night of 11 November 1989. A Meteorological Officer from RAF Wattisham, driving on the A45 saw “a white light stationary in the sky with a small red light descending from it as though it was a parachute flare”. No aircraft were in the area at the time. Eastern Electricity traced the power cut to “a switch-gear [which] had blown up due to water contamination.” DEFE 24/1938: 59-61.